Summertime brings plenty of opportunities to enjoy the outdoors with family and friends, but recent record-breaking temperatures across the US have made dehydration a real concern for many people. Dehydration is a condition in which the body does not produce or have the amount of water that it needs to properly function. It’s important to note that this condition can occur for many reasons, in addition to increased heat exposure. 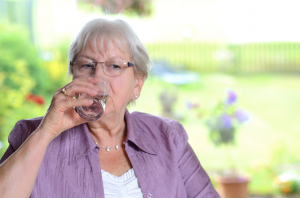 Some other causes of dehydration are excessive perspiration, not drinking enough water, the side effects of certain medications, and fluid loss from an illness such as a stomach viruses. Let’s take a closer look at the dangers of dehydration and what precautionary steps can be taken for prevention. Heat injuries (e.g. migraine headaches, muscle cramps, heat stroke or heat exhaustion). Seizures brought on by an imbalance of electrolytes. Kidney problems such as urinary tract infections or kidney stones, or in a worst-case scenario – kidney failure. A life-threatening drop in blood pressure due to a reduction in blood volume. Damage to nerve and muscle function. In severe cases, dehydration can result in death. No urine or urine that is dark in color. Skin that is dry and cool. Headaches and muscle cramps or muscle aches. Keep a container of water nearby and take sips throughout the day, rather than drinking large amounts all at once. Avoid beverages that contain caffeine as it can contribute to dehydration. Consume fruits and vegetables that have a high water content. Experiment with drinking water at different temperatures or adding a slice of lemon or a sprig of mint to your glass. Finding your personal preference will make water consumption easier. Enjoy popsicles as a dessert or snack. Keep a large bottle or carafe of water placed in each room so that it’s always easily accessible. Every time you go outside – whether for a short stroll or a longer outing – bring your own water bottle and take sips often. Greater emphasis on self-care and wellness will contribute directly to your longevity, health and overall wellbeing. At Lighthouse Senior Living we believe that enjoying a wide variety of activities is one of the keys to a robust and vibrant life. Schedule a tour today to learn more about our lifestyle.